Successfully Added Solid State SATA Hard Drive - 64GB SSD to your Shopping Cart. Solid state SATA hard drive with 64GB capacity in standard 2.5 inch SATA form factor. This slim and durable SSD hard drive is the future of mobile storage. The solid state drive provides a fast, lightweight, durable, ultra quiet and lower power consumption storage medium suitable for todays mobile user. Popular for laptops / netbooks / notebooks that get a lot of wear or are sometimes used outdoors, SSD drives also better endure vibration and variable temperatures. Unlike conventional hard disk drives that use mechanical parts, this compact 2.5 inch HDD uses memory chips to store, read and write application data. With a solid state drive you will instantly notice the speedier computer access time to software applications and also eliminate the risks of mechanical failure, thereby improving performance and security. 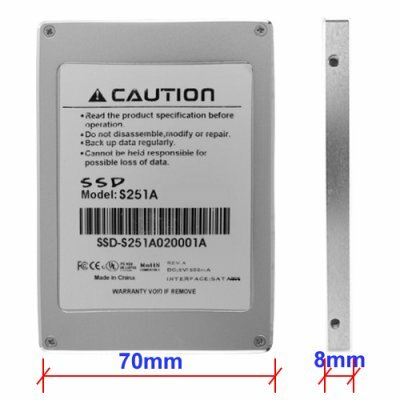 A great wholesale price makes this SATA 64 GB solid state hard drive perfect either for the resale market, OEM market, or personal/company use. As always, it is only available from your source for wholesale direct from China electronic products, Chinavasion Electronics. Ultra fast! - Read/Write Speed: 119mb/s read, 80mb/s write (average). Quiet, low power consumption storage drive for modern ultra portable computers (netbooks, notebooks, tablets, laptops).